Elizabeth Young, 1909. Photo by Lewis Hine. It took me a month to identify the youngest girl in the photograph. Nobody I talked to had any idea what her name was. Then Mary’s daughter, Annie Lou Burke, told me that one of Catherine’s children was named Elizabeth. But for several months, I couldn’t track her down. No one in the family knew anything about her. I figured that she might have been legally adopted and took a different last name. I had requested the records for the children at the Methodist Home, and they finally arrived. Listed among the children was Lizzie, born about 1906, and discharged on July 12, 1910, to the home of J.D. Murdough, of McRae, Georgia. I searched the 1920 census for McRae, and found J. Edward Murdaugh (51), his wife Alice (46), son Lamar (22), and 13-year-old Elizabeth Murdaugh. Mr. Murdaugh owned a grocery store, and son Lamar was an attorney. But I got stuck again. Elizabeth Murdaugh was not listed in the 1930 census, so I assumed that she was married by then. But to whom? There was an intriguing clue. In the 1930 census, Mr. and Mrs. Murdaugh had a six-year-old grandson living with them. His name was Jesse Smith. Since Lamar appeared to be their only other child, I was almost certain that Jesse was Elizabeth’s son. But where was Elizabeth? How do you search for a common name like Elizabeth Smith, if indeed, that was her last name? I called the library in McRae. One of the staff remembered the Murdaughs, but not Elizabeth. She gave me the phone number of a 90-year-old woman named Ruby, who is the town’s unofficial historian. Ruby connected me to Lamar Murdaugh’s grandson, and he told me that Elizabeth married Jesse Smith, and that she left her husband several years after son Jesse was born and then married again, but that was all he knew. At that point, I ran into a huge break, and the mystery began to unravel. 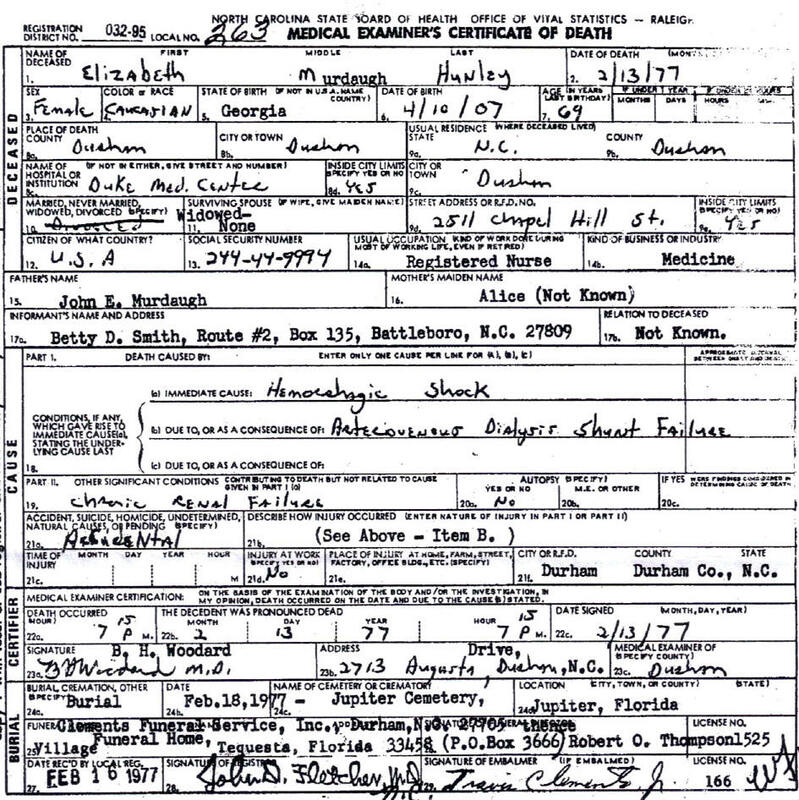 I searched on FamilySearch.org, and found the death certificate for a woman named Elizabeth Murdaugh Hunley, born in 1907 (I confirmed later that she was born in 1906). She died in Durham, North Carolina in 1977. Her parents were listed as John E. and Alice Murdaugh. I could not locate an obituary. 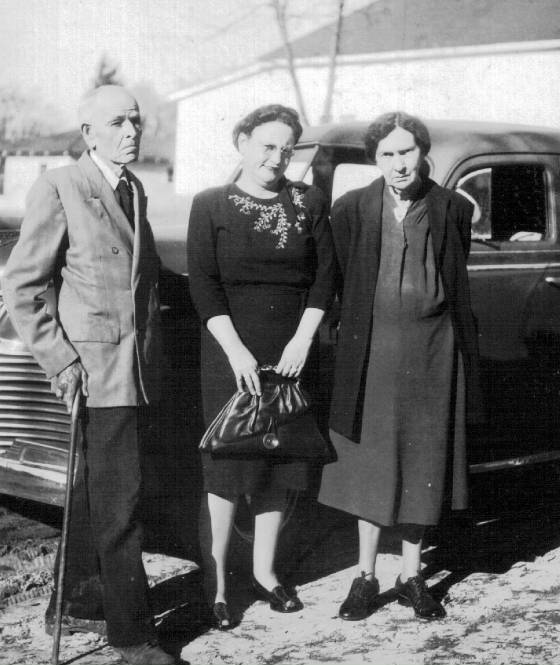 Elizabeth Young (Murdaugh) with John Edward and Alice Murdaugh, 1940s. 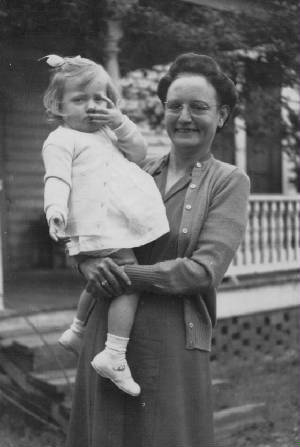 Elizabeth Young (middle name undetermined) was born on April 10, 1906, so she would have left the orphanage at the age of four. She was apparently adopted by Mr. and Mrs. Murdaugh. She married Jesse Erskine Smith in the early 1920s. They had a son, Jesse Smith Jr., who was born about 1924. At some point, Elizabeth abandoned her husband and left town. Son Jesse Jr. went to live with the Murdaughs. Jesse and Elizabeth divorced soon after. Jesse eventually remarried, to Sue Anderson, and had a daughter, Billie Sue, making her the younger Jesse’s half-sister. Elizabeth married two more times, first to a doctor whose name is undetermined. They lived in Savannah. After that marriage ended, she married Evan Hunley. She had no children with either husband. Her son, Jesse Smith Jr., married Betty Davenport. They had two daughters, Evan (Evie) Smith (now Evie Taylor) and Jessica Smith (now Jessica Woolard). Jesse and Betty divorced, and Jesse Jr. remarried. He died in 1982, at the age of 58. I located Elizabeth’s granddaughters, Evie and Jessica, after obtaining the obituary for their mother, Betty Davenport Smith. Edited interview with Evie Taylor, granddaughter of Elizabeth Young. Interview conducted by Joe Manning (JM) on June 6, 2011. Elizabeth Young Murdaugh Hunley with Evie Smith (now Taylor), about 1949 (interviewed below). Taylor: In 1947. My full name is Evan Elizabeth. I was named after my grandmother Elizabeth, and her third husband Evan. I was born in Portsmouth, Virginia. At the time, my parents were living with Elizabeth in an upstairs apartment in her house. She was married to Evan Hunley then. I lived there a short while, and then we moved to Charleston, West Virginia. My grandmother Elizabeth was a real troubled person, and so was my father, Jesse Smith Jr. My father’s half sister, Billie Sue, told me that one time my father and some of his friends were waiting for Elizabeth to visit them in Georgia. She was arriving on the train, and my father had to go somewhere for just a short while, so he asked his friends to stay there and wait for her. They asked how they would know who she was. He said, ‘You’ll know because she will be the prettiest woman that gets off that train.’ That said a lot to me about how he really felt about her, but still, they had a very hard time connecting. I think there was a lot of baggage in the way. JM: Do you think that might have been because she left town when your father was very young, and left him in the care of his father, Jesse Smith Sr.? Taylor: Yes, I think so. She was always leaving. 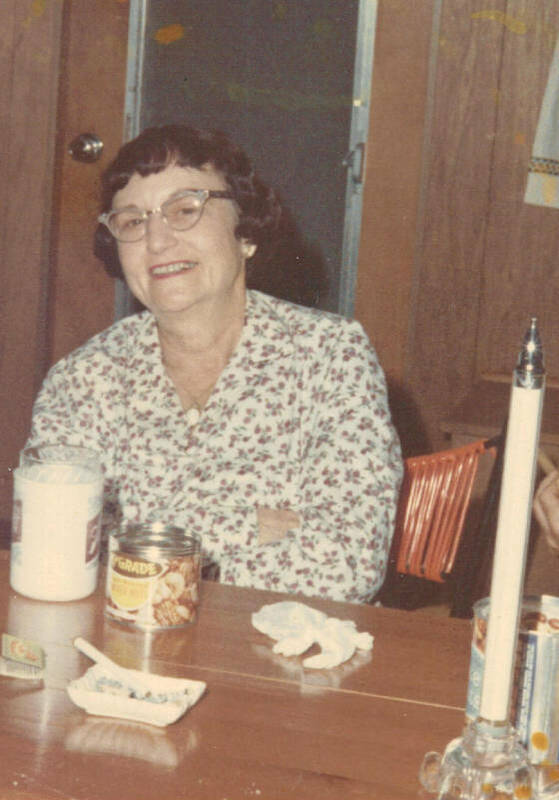 I spoke with a gentleman recently who is a grandson of Mr. and Mrs. Murdaugh – we called Mrs. Murdaugh ‘Mama Murdaugh’ – the couple that adopted my grandmother. He told me that the only thing he knew about Elizabeth was that she would just show up, drink too much, and then disappear. But I don’t want to paint her as something she wasn’t. She went to nursing school. She took very good care of her appearance. Even when she was old, she had beautiful skin. She bought expensive cosmetics. She was always well dressed. When I was a very young, my father was in the Merchant Marine, and my mother was a bookkeeper. After we lived in West Virginia, we moved to Rocky Mount, North Carolina, with my mother’s parents. When I was in high school, my grandmother – my mother’s mother – told me that my father had been in prison, and that he had a problem with gambling and alcohol. I had never been aware of that. He had huge successes in business, but then he would just shoot himself in the foot. He helped start some Holiday Inns, and then he sold his share in the business. He was also a contractor. He built homes in Aiken, South Carolina after he got out of prison. I was seven years old then. Somehow, he came out of prison with enough money to start a business. I don’t even know now if it’s all true, because there were a lot of secrets in my family. I never knew what to believe. During those years in South Carolina, my mother was very upset a lot, and my relationship with her was very unloving. My father would take off and be gone for sometimes months at a time. I don’t think my mother even knew where he was. I felt the effects of her being so upset. 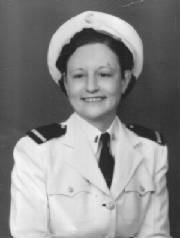 Elizabeth Young Murdaugh, as a Navy nurse. JM: What was Elizabeth doing when she was living in Portsmouth? Taylor: She was a nurse. Before that, she had been a nurse in the Navy. Evan, who I referred to as my grandfather, was an engineer at the Navy Yard. They were always taking trips, and when they did, they would often stop by to see us for a few days. JM: Was that always a welcome visit? Taylor: Oh, yes, for both me and my father. Whatever their problem was, it was not talked about. 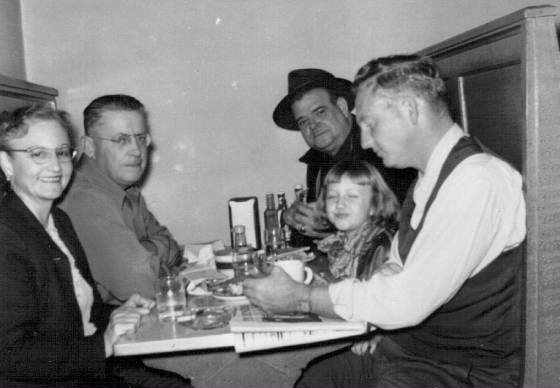 On left: Elizabeth Young Murdaugh Hunley and David Davenport (Evie’s maternal grandfather); on right, front to back: Jesse Smith, Jr. (Elizabeth’s son), Evie Smith (now Taylor) and Evan Hunley (Elizabeth’s husband), circa 1952. JM: When she visited, did you spend a lot of time with her? Taylor: Not really. She spent a lot of time with the adults, but she spent some time doting over me. I remember going to visit her, and she always made buckwheat pancakes for me because she knew I liked them. Every birthday I had, and on Christmas and other special days, she would send me pieces of Sterling silver. JM: What was Evan like? Taylor: He was also more involved with the adults. They liked to sit around and have drinks and talk and laugh. When I was about 11, my grandmother and grandfather moved to Florida. They bought a place on the inland waterway in Jupiter. I went on the train once to visit them, and I was supposed to stay for two weeks. I had the most miserable time of my life. I was so homesick. I thought those two weeks would never end. My grandmother worked as a private duty nurse, and I had to stay with my grandfather during the day. I got to see what he was really like. I had this sense that he didn’t care about me. Maybe I was just so homesick, and I was imagining it. JM: Were your parents still living together at that time? JM: When did they divorce, and when did your father remarry? Taylor: They divorced the summer after I graduated from the eighth grade. My parents had moved to Miami after one of my father’s business partnerships broke up. We lived at the Congress Airport in Coral Gables, where he ran the airport. Then something went wrong with that, and that’s when my parents separated, and my sister and my mother and I went back to Rocky Mount to live with her parents. About a year later, my father visited us a couple of times. I had this little part-time job. He wanted to cash a check, so I cashed it for him and it bounced. After that, there was a period of 13 years when we didn’t hear from him at all. When I was younger, I fantasized that he was going to come back and everything was going to be wonderful. When I got older, got married and had children, I prayed a lot that he would come back, but I didn’t know what had happened to him. When we did hear from him, he was sick and he thought he was going to die. He got in touch with us, and then came to our house to visit. That was when I found out that he was married again. JM: Were you aware that Elizabeth had been adopted? JM: Did you ever ask Elizabeth about it? Taylor: In my family, there were so many secrets, and what I learned as a child was to do whatever made them happy, so I only talked about pleasant things. 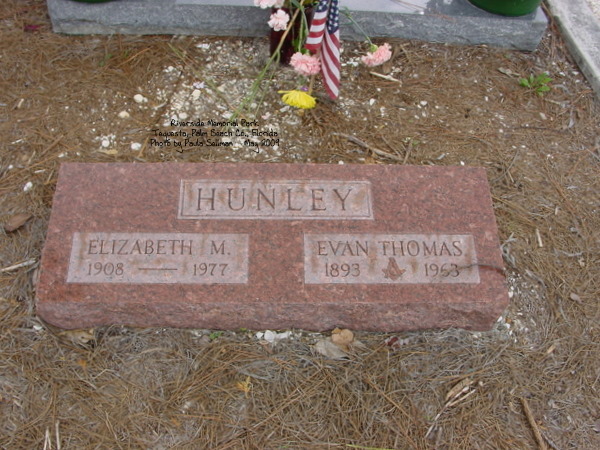 JM: Did your grandmother continue to live in the house in Jupiter after Evan died in 1963? Taylor: After he died of cancer, my grandmother sold her house in Jupiter, and probably got a lot of money for it. She moved into a duplex apartment in Jupiter that was owned by a woman who was a secretary for a high-powered attorney. My grandmother had a lot of nice things, like furniture, silver and expensive jewelry. Then she got sick and had to be on dialysis. Because she had been a Navy nurse, she went into a Navy hospital in Miami. The social worker at the hospital contacted me about my grandmother. I learned that while she was at the hospital, the woman who owned the apartment had written her a letter and told her she had to be out of the apartment in a short period of time. It seemed like she was going to take everything she had. I was willing to help my grandmother, so I told that to the social worker. We decided on a plan. I took the train down to meet her. I had my three young children with me. I was not living with my husband any longer. They told her that she could be off dialysis for a few days at a time. I was going to move her to Rocky Mount, North Carolina, where I was living. My sister also lived in North Carolina with my mother and my mother’s mother. We were the only family that Grandma Elizabeth had. But my mother didn’t offer to help. So I’m this young mother with three children and nobody supporting me, and I had to help my grandmother by myself. We rented a U-Haul and hired somebody to help us get all her stuff packed. Then my grandmother and I went to a motel and spent the night, and the next day, she took the train back to the hospital where she stayed a few more days. I drove the U-Haul back to North Carolina, while towing her car behind it. It was the most dreadful thing. When I got back, my other grandmother let me store all her stuff in a garage that she had on her property. Then my grandmother took the train to North Carolina. But we couldn’t bring her to Rocky Mount, where I lived, because there was no dialysis available there. The closest place was in Durham. So she got a place to live there, and I got my grandmother moved. I had to drive her to Durham with my three children in the car, and it was about two hours away. It was a nightmare. It turned out that the place she had rented was nothing like she was accustomed to. It was like a boarding house. She was there only a few months, and then she died, right in the house. They contacted me. They said that her dialysis equipment was no longer in her arm. I wondered if she might have committed suicide, that she just ripped it out. The minute I took her there, she was unhappy, so I felt that she was unhappy with me. I was young, and I thought I was trying to do the right thing. I had to do something. I felt that I was responsible to help. I wanted her to be happy, and with family. But she was never a happy person. I think she had a lot of resentment. When she would go and visit family, she just couldn’t stay very long. She wouldn’t be happy around them, and they wouldn’t be happy around her. But I think her last husband, Evan, was the love of her life. They were very much alike. They loved each other very much. JM: Do you know whether she ever saw any of her brothers and sisters after she was adopted? Taylor: I don’t know for sure, but I don’t believe she ever made contact with any of them. The story that I was always told was that she didn’t know what happened to them. But she was a resourceful woman, and if she had wanted to get in touch with them, she could have found a way. JM: None of the other children’s descendants that I talked to had any idea what happened to her, so you are probably correct. None of them knew anything, except one who said he thought that Elizabeth had married someone with a lot of money. Taylor: That would have been when she married the doctor, her second husband. JM: What was your reaction when I sent you the photo of Elizabeth? Taylor: I always wondered where she came from, and what her life was like before she was adopted. The picture kind of helped me to understand more about why she was the way she was. I felt sad, because I didn’t feel that Mama Murdaugh loved her. They didn’t talk nice about each other at all. There was a lot of anger between them. My grandmother grew up and went through life without any love, until she met Evan. There is one more thing I want to tell you about her. 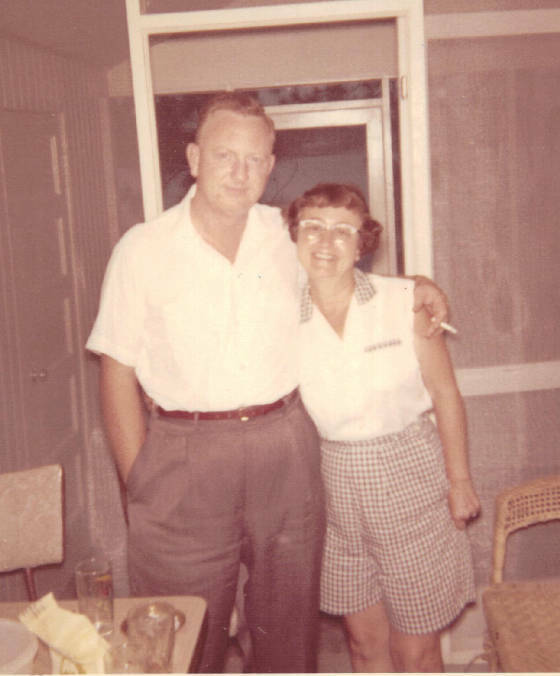 She lived on one side of the inland waterway in Jupiter, and Joseph Kennedy, President Kennedy’s father, lived in a mansion in West Palm Beach, on the other side of the waterway. Mr. Kennedy was one of the persons she worked for as a private duty nurse. She told me that he was difficult to work for. One day, while she was taking care of him, they got into an argument, and he slapped her. She called him an SOB and walked out. Edited interview with Jessica Woolard, granddaughter of Elizabeth Young. Interview conducted by Joe Manning (JM) on July 26, 2011. JM: What did you think of the photograph of your grandmother? Woolard: I was so excited to see it. I have always wondered where she came from, and what her past was. No one ever talked about it. I knew she was adopted, but I didn’t know what the circumstances were. I was born in 1953. I was six years younger than my sister Evie, so she spent much more time than I did with Grandmother Elizabeth and Papa Ev, her third husband. But when I was older, we still kept in touch. She came to visit once in a while. JM: Did she ever talk to you about being adopted, or about her adoptive parents, the Murdaughs? JM: Did you ever meet the Murdaughs? Woolard: Yes. When I was living in Aiken, South Carolina, which is where I was born, Mama Murdaugh, as we called her, was brought to our house. She was sick, and my mother helped nurse her back to health. JM: Did you know at that time that she was your grandmother’s adoptive mother? Woolard: It never even dawned on me then. I had so many grandmothers and grandfathers. My father’s father, Papa Jesse Smith, was married to Sue, his second wife. I called her a grandmother as well. And I thought of Mama Murdaugh as a grandmother. And then there was Papa Ev. I just thought that every family was like that. Grandmother Elizabeth was so good to us. There was no doubt in my mind that she loved me and my sister. But you knew she was all business as well. If she told you to do something, you’d better do it. But she was never mean. I had a lot of respect for her. She was a hard worker. When she was much older, my grandmother had a bad kidney problem and had to be on dialysis. She died in Durham, North Carolina. From what I understand, there was a clamp that was on the vein of her wrist, and somehow the clamp came off and she bled to death. When I was told that, I thought that she might have committed suicide. And if she didn’t do that, I thought about how sad it would have been if the clamp had come off, and she didn’t have enough strength to help herself. We’ll never know. My mother and I were the ones that buried her. My sister was unable to come, and my father didn’t come. 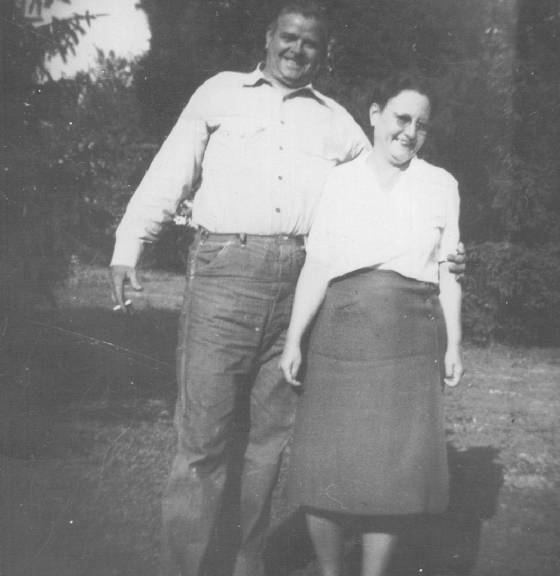 Elizabeth Young Murdaugh Hunley with son Jesse Smith Jr., 1960. JM: Why didn’t your father go the funeral? Woolard: I don’t really know. There never was a great love between my grandmother and my father. She could say some horrible things about him sometimes. They were both very grudging people. I am, too. I get it from that side of the family. It’s still so hurtful to me that my father abandoned my sister and me. When I saw the photograph and started thinking about all the problems in my family, I said, ‘Damn it, all of you. I broke the cycle.’ I did break the cycle in this family. I’ve got a wonderful husband and we get along beautifully. JM: As we know now, your grandmother had a very difficult childhood. Her father died when she was a year old, and her mother gave her up for adoption two years later. Woolard: I can’t imagine that her mother would have had the time and energy to treat her like a small child should be treated. Her mother was my great-grandmother, and I don’t believe she was a bad person. She was in an awful situation. She apparently had no other option but to take them to the orphanage. Somehow, my grandmother survived. Elizabeth Young Murdaugh Hunley, early 1960s. Correct year of birth is 1906. Riverside Memorial Park, Tequesta, FL. Courtesy of FindAGrave.com. Correct year of birth is 1906.